In an earlier post I took a swipe at the likes of NAB, the RBA, Bernard Salt at KPMG, the ABS themselves, Business Insider, and Macrobusiness for their persistent failure to mark a sweeping definition-change that completely broke the continuity of the migration data they were reporting. I should write to them all and apologise for the fuss, because their indiscretion has been completely overshadowed by the perhaps the most ghastly abuse of data I’ve ever seen. The litany of data-sins committed in this graph is so galling that I barely know where to start. Let’s start where I started with everyone else: a failure to point out the definition change in Net Overseas Migration in 2006. But there’s so much more. The columns here are at quarterly frequency, but the rate implied is actual annual, so we can’t really gauge the order of magnitude. ‘Migration’ isn’t defined, though I can see they mean the official Net Overseas Migration statistic. Read literally, the label ‘Short-term arrivals’ suggests one-way movement, though one suspects (or hopes) they mean net arrivals. 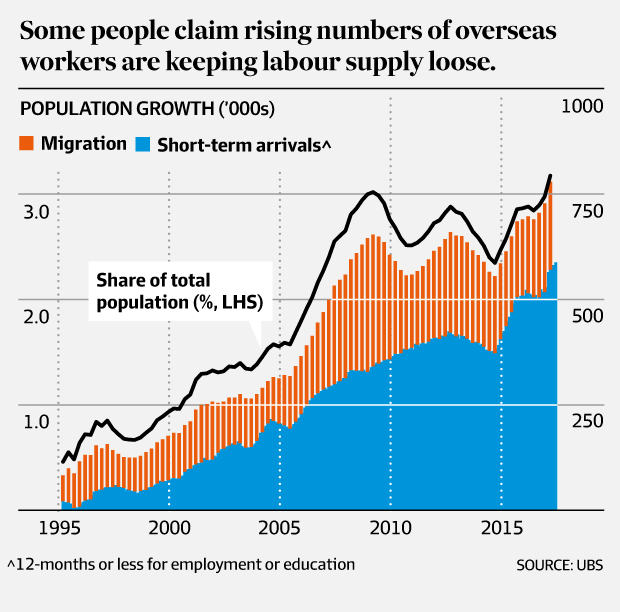 The only clear lablel is “POPULATION GROWTH”, which is the only one which is absolutely uncontravertabely incorrect, since there’s no inclusion of births and deaths, let alone any justification for stacking up the official Net Overseas Migration with a selective, small sub-set of short-term movements. Unfortunately Chris missed the triple-asterisk, pointing out the epic flaw in heart of this graph which makes it so utterly erroneous, misleading, and altogether an absolute abomination on the analytic and data-serious community that I once thought UBS might belong to. So sadly the essential point of his video and article is a 100% true-blue, genuine, balls-to-the-wall, factual blunder. GULP. Contrary to Chris’s assertion in his article, Net Overseas Migration does not just include permanent residents. Infact, it has absolutely nothing to do with someone’s visa status at all. As I’ve laboured before, it’s an arbitrary definition that counts someone as ‘resident’ if they are here for 12 out of 16 months cumulatively, and non-resident if they are overseas for the same cumulative part of any 16 months. Three quarters is the rule that determines if you’re resident or not. It’s a rule designed specifically to capture the ‘expats’ that Chris dwell so heavily on as if they’re the missing piece. If these arrivals are students who are here for a course/visa that lasts a couple of years, but take a sizeable ‘holiday’ back home or elsewhere overseas during their course, it’s almost certain that they’ll become ‘resident’ under the 12/16 rule of Net Overseas Migration, as well as arriving at least twice, “Short Term” for Education in Australia. 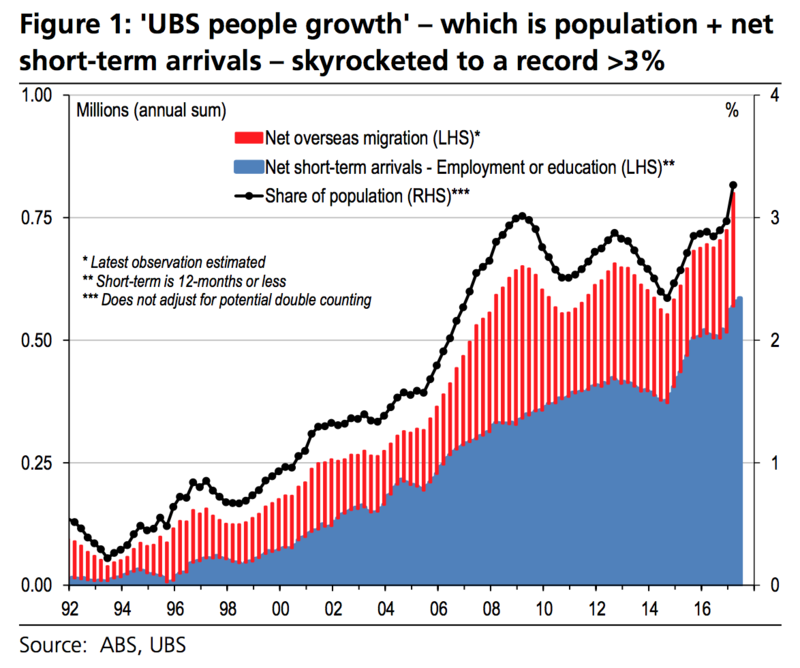 So UBS’s graph will actually triple-count those people, or worse, if they take another trip home. Why would UBS ever present such data in the first place, if they know it’s likely to present such completely misleading false conclusions? The mind boggles. Perhaps they don’t even realise. It’s the pinnacle of embarrassment for an investment bank. If I were wealthy I’d make sure that my money never went near the hands of people doing analysis like this. Here we can see that there’s been explosive growth in outbound holidays from Australia.